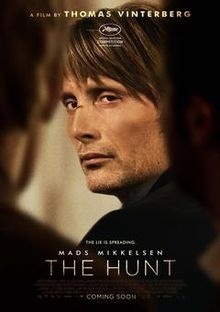 First off, let me say that this Danish movie directed by Thomas Vinterberg, is worth seeing. I did, however, have mixed feelings about it. For several reasons. The premise is that a little girl of about 6 accuses her father’s best friend of sexual abuse. The best friend, Lucas ( a great performance by Mads Mikkelson) also happens to work at the kindergarten this child attends. The child felt upset with him and accused him so that he would be in trouble. I find it hard to believe that a child of this age could be that aware of the consequences of this accusation as this child is. Despite that, the havoc this creates in Lucas’s life is horrendous and the various relationships he has with different people are all affected in one way or another. This is brilliantly depicted and I was torn up (and teared up) at witnessing this. The culture of this small village is interesting and contributes to the outcomes. These men drink and hunt and are prone to flares of anger that lead to violence. Spoiler alert – the uneasy reconciliation that occurs seems a little too facile and then the movie jumps to a year ahead. It is almost as if the movie had to be wrapped up so let’s get on with it. The end is mysterious but this I did enjoy. I am not a fan of easy resolution. Lastly, I am often uneasy when the focus of this sort of situation is on the wrongly accused man. I have no doubt that this occurs but if one had to compare the incidences of the wrongly accused man with those of the ‘never accused when they should be’ men, the weight will fall on the latter. Nevertheless, it does highlight this injustice which can partly be attributed to the hype around abuse. Having said that, again, I wonder can there be too much hype around abuse? Given its prevalence? A difficult question.